The Global Volcanism Program has no activity reports for Pocdol Mountains. The Global Volcanism Program has no Weekly Reports available for Pocdol Mountains. The Global Volcanism Program has no Bulletin Reports available for Pocdol Mountains. The triangular-shaped Pocdol Mountains volcanic range, also known as the Bacon-Manito complex, covers an area of about 225 km2 between Saragon Bay and Albay Gulf in southern Luzon, SE of Mayon volcano. Volcanic cones in the western part of the complex are dissected, but those in the eastern part are morphologically youthful. Several Pleistocene K-Ar dates have been obtained from the volcanic complex. The age of its latest eruptions is not known, but a fumarole field that contains a geyser is located near the summit of the compound, dominantly andesitic volcanic complex. The Global Volcanism Program is not aware of any Holocene eruptions from Pocdol Mountains. If this volcano has had large eruptions (VEI >= 4) prior to 10,000 years ago, information might be found on the Pocdol Mountains page in the LaMEVE (Large Magnitude Explosive Volcanic Eruptions) database, a part of the Volcano Global Risk Identification and Analysis Project (VOGRIPA). There is no Deformation History data available for Pocdol Mountains. There is no Emissions History data available for Pocdol Mountains. 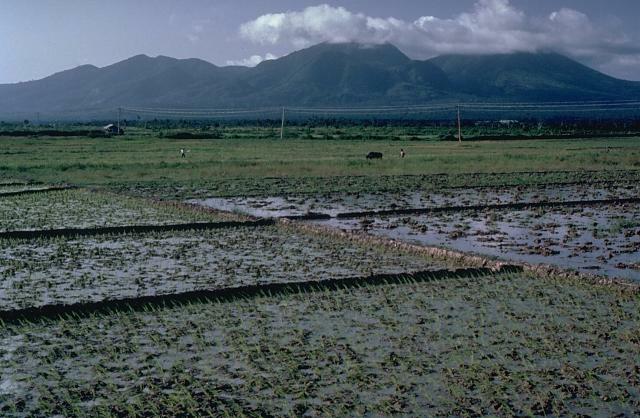 The linear Pocdol Mountains lie between Saragon Bay and the Albay Gulf in southern Luzon. This view is from the south, near the town of Sosogon. A fumarole field that contains a geyser is located near the summit. Little is known of the geologic history of the Pocdol Mountains. There are no samples for Pocdol Mountains in the Smithsonian's NMNH Department of Mineral Sciences Rock and Ore collection. Large Eruptions of Pocdol Mountains Information about large Quaternary eruptions (VEI >= 4) is cataloged in the Large Magnitude Explosive Volcanic Eruptions (LaMEVE) database of the Volcano Global Risk Identification and Analysis Project (VOGRIPA).